Update: This topic was granted ‚Solution’. It was initially shared under the name: „Workshop – Make Compost Not War, Guerilla Composting“. It contains links to external resources about home Wormcomposting and Bokashi (a special form of composting). It is a good pointer that there are a lot of great open source resources about home composting on the web – forums, videos, websites in several languages. Let this topic be your starting point. Composting is fun! Ariane Krause and Lusi Ajonjoli: Advocates for soil remediation and food sovereignty. In this 2 hour workshop at OSCEdays Berlin 2017, we will talk about the different ways we can make compost in the city, in a small space and also, for example, in a flat. We will follow up to discuss and explore different means of using locally available resources, such as kitchen and food ‘waste’ for composting. The use of ‘kitchen compost’ allows for recycling nutrients and for making fertile soil. Ultimately, we can enrich the soil around us and prepare the ground for (guerilla) gardening. Specifically, we will focus on lacto-fermenting kitchen waste as inspired from Bokashi, as well as maintaining earthworms for vermiculture. We aim to share practical techniques for cultivating and applying your compost. Additionally, we’ll open the conversation to alternative ‘waste’ management, or ecological sanitation, and ‘Terra Preta practices’ and further to soil microbiology. Soil is a living system, and we’ll work in groups to learn about its moving parts and why it’s important for us. In diesem 2-stündigen Workshop werden wir mit den Möglichkeiten der Kompostierung in der Stadt, auf kleinem Raum und zum Beispiel auch in der Wohnung gehen. Wir wollen uns damit beschäftigen, diskutieren und ausprobieren wie vorhandene Ressourcen - zum Beispiel Schnippel- oder Containerreste- kompostiert werden können, um die darin enthaltenen Nährstoffe zu recyceln um am Ende fruchtbare Erde statt „Biomüll“ entstehen zu lassen. Schlußendlich, können wir damit den Boden um uns herum wieder aufbessern und so eine Grundlage für „Guerilla Gardening” Interventionen schaffen. Insbesondere liegt unser Fokus auf der Milchsäure-Fermentation, die inspiriert ist durch die Bokashi-Praxis, und auf Regenwürmern und der Wurmkomspotierung. Wir möchten gerne ganz praktisch mit euch teilen, wie wir Kompost machen und verwenden. Außerdem möchten wir die Diskussion gerne noch erweitern und unser alternative Verwertungsansätze anschauen, die Abfälle als Ressource sehen, wie zum Beispiel die “Ökologische Sanitärversorgung”, oder die “Terra Preta Praxis”, und auch weiter hinschauen, in die Boden Mikrobiologie. Der Boden ist ein lebendes System, das wir uns Gruppen genauer anschauen werden und lernen, was sich da so bewegt und warum das wichtig ist für uns. 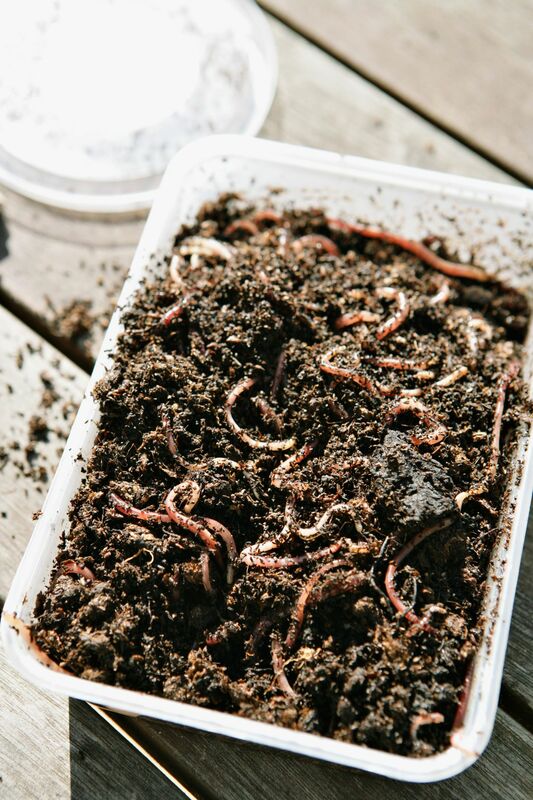 This article explains everything from selecting a bin size, to using the right types of worms and how to prepare the bedding. Search the web for more. Also in your language. Want to recommend a resource? Pls. share the link below. Just needs to be translated from German… any good English language sources for something similar? Now I had the idea to build a combined square tumbler with integrated sieve in Berlin in 2019. Anyone interested? I thought of connecting with Himmelbeet or Peace of Land for on-site support.